In his piece "Apple's Next Move: Be More Like Microsoft," Christopher Mims portrayed Apple as making a "radical shift in its corporate strategy" by licensing the AirPlay protocol and supporting iTunes content playback on non-Apple platforms. He also cited Apple's move last month to support Apple Music on Amazon's Alexa-powered Echo appliances as another example of the company "blasting holes in the boundaries of its staunchly defended walled garden," by allowing its own media content services to work on non-Apple hardware. "For years," Mims dramatically wrote, "a big part of Apple's premium experience-- and justification for its premium pricing-- has been that its software and services are only available on its hardware." That's not even remotely true, though. The Wall Street Journal's characterization of Apple's "Walled Garden" as being a retaining wall of exclusive, proprietary services propping up its premium-priced hardware sales is baffling. The entire concept of the iOS App Store acting as a Walled Garden has only ever referred to the company's restriction against potentially malicious software from unknown sources. Some critics denigrated Apple's "Walled Garden" App Store as too restrictive, but everyone agreed on what the phrase meant: Apple was blocking third party stores and the "side-loading" of non-encrypted, unsigned apps from potentially nefarious fraudsters. Using the term to refer to something completely different is a totally made-up fiction that Apple's media services only work, and only ever have worked, on Apple hardware. Apple premium experience is a combination of higher-quality hardware-- specialized silicon for advanced custom processors and controllers; calibrated displays; precision manufacturing; and advanced design-- paired with advanced software, including Apple's proprietary operating system, development frameworks, and high-quality apps bundled for free. It has never been associated with being "the only way to play iTunes or Apple Music content." Every example of licensing that Mims offered was factually false. Apple Music was launched with support for both iOS and Android in 2015, and was based on the Beats Music app that Apple continued to support on Android after acquiring Beats. The service was never exclusive to Apple hardware, nor in any way capable of propping up "premium pricing." Apple has also licensed AirPlay to third parties since 2010, supporting a variety of audio manufacturers including Bang & Olufsen, Bose, Bowers & Wilkins, Denon, Marantz, McIntosh, Onkyo, Philips, Pioneer, Sony, and Yamaha. AirPlay 2, announced last summer at WWDC, was specifically detailed as a technology third parties could license to bring all of its new features-- including parallel streaming to multiple devices in different rooms-- to their speakers, televisions and other playback devices. Apple has also supported the iTunes Music store and video purchases on Windows since 2005. And Apple has also supported, licensed, or shared a variety of its other services and technologies on competing hardware platforms, from FireWire to Safari to iCloud to Bonjour. 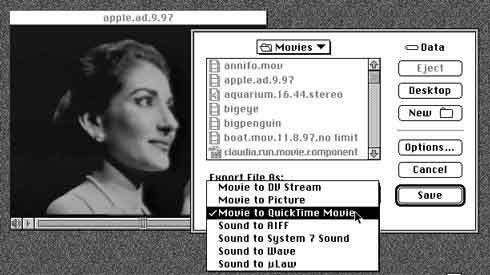 QuickTime, Apple's original media platform, was officially supported on Windows way back in 1992. QuickTime for Windows was a notable event because its efficient code was so good that Microsoft, Intel, and American Canyon were charged with stealing it to develop a rival "Video for Windows" on PCs-- launching a famous legal scandal that wasn't resolved until Steve Jobs leveraged the threat of a multibillion dollar lawsuit to prompt Microsoft to make a show of voluntary investment in the Mac in 1997. In 1994, Apple did so much work to port huge parts of the Macintosh System Software to Windows in order to launch a feature-complete QuickTime 2.0 on Microsoft's platform that it ended up making its Classic Mac OS portable enough to move to the NeXT-based Mac OS X as the basis of the Carbon API. This stuff isn't really a secret; it's fundamental to any knowledge of what's been going on at Apple over the last three decades. Mims acknowledged actually knowing that Apple "did port iTunes to Windows in 2003, which helped the nascent service and the iPod take off," but called the strategy of making its media content platforms available to users outside of Macs and iOS devices "mostly alien to Apple." In contrast, he wrote "it's familiar to Google (you don't need an Android phone to use Gmail), Amazon (you don't need a Kindle to read Amazon's e-books) and even-- more recently-- Microsoft." That's nothing short of bewildering. You don't need an "iOS phone" to access Apple's iCloud email either-- or iCloud Contacts, Calendar, Notes, Photos, or iCloud Drive. And while Apple didn't create an EPUB reader for Amazon or Windows, Apple Books uses a standard file format, unlike Amazon. Apple even ported its iWork apps to work on Windows and Google web browsers, for free. Mims then praised Microsoft, writing that under Satya Nadella, "the company has been characterized by rapid strides to get Microsoft's services onto every device possible, not least of all those running an OS from Apple or Google. The strategy has paid off handsomely -- as of this writing, the company's market capitalization is higher than Apple's." Nadella has only been running Microsoft since 2014, and hasn't really changed the availability of Microsoft's media services on other platforms. He did release Office for iPad, but Macs have been capable of running Windows Media content since long before the Zune imploded in failure. And Microsoft's valuation as a company has absolutely nothing to do with its media content efforts, which have largely been a huge flop. The world isn't subscribing to Microsoft movies. A primary reason why Apple -- a fantastically more profitable company than Microsoft -- has such a low comparative stock valuation this winter is a series of incorrect stories-- many from the Wall Street Journal-- about China and the iPhone XR failing Apple as unsalable albeit also being its popular first-place iPhone sales leader, over the last two quarters where Apple has actually been delivering massive growth in Services that just weeks ago propelled the company to the world's first trillion dollar valuation. Mims again stopped to acknowledge that it was Microsoft and Sony -- not Apple -- that once "tried to control every part of its ecosystem," an apparent reference to the DRM that those two former media giants once wielded to restrict where and how their content could play. It was Apple's DRM-free music on iPod and iTunes that made it possible to buy downloads that could play anywhere. Yet he then returns to a fantasy world where it was Apple that was supposedly restricting where content could play and who could license its media-delivery protocols just so it can raise prices of its hardware, as if that even makes any sense at all. "Opening up may not merely be a means of maintaining Apple's growth but ultimately its survival," Mims wrote. "It appears finally willing to sacrifice some hardware revenue in the hopes of growing its services. Still, these are baby steps. We're a way off from the company feeling pressure to, say, license iOS to Huawei." Yes, Apple isn't licensing iOS to Huawei. That has nothing to do with media content delivery. And as far as Apple's "hopes of growing its services," well, no need for "hope." In fiscal 2018 Apple's Services segment brought in $37.2 billion, more than a third of Microsoft's entire revenues for the year-- which were driven by highly profitable enterprise cloud services, not the less profitable media content or delivery of same. Mims continued with his wholly incorrect idea that Apple is desperately shoring up failing hardware sales with content licensing deals using more fictions, writing that, "Apple may dominate sales of high-end smartphones in the U.S., but for the rest of the world Android is the norm." 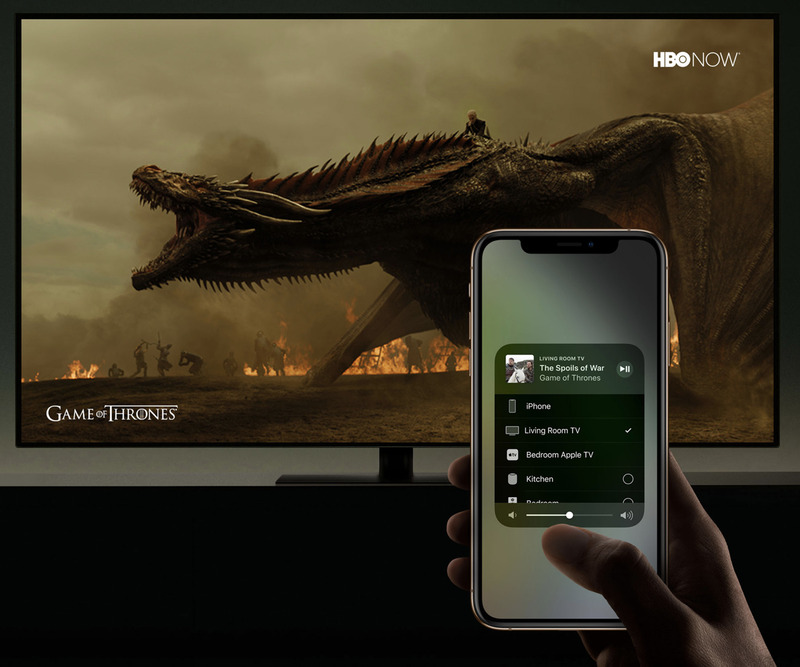 Note that Android has nothing to do with Samsung adding support for iTunes videos on its Tizen smart TVs, or broad new industry support for AirPlay 2 streaming. But the idea that Android is "the norm outside the U.S." is also not true. Apple's iOS is the norm for most of the affluent world. In first world markets, the iOS installed base accounts for the majority of mobile activity: 75 percent in Japan, 65 percent in the U.S., and between 50 and 60 percent in Australia, Canada, UK, Ireland, and Sweden. Apple sells most of the premium phones sold to affluent urban Chinese, and virtually all of the high-end hardware sold anywhere. These are also the markets that are paying for music and movies. Android has a lead in emerging markets that can't afford to pay for services. Ask Amazon. Its Prime service costs $119 per year in the U.S., but in India, Prime can only fetch $14.50 annually. Facebook similarly earns pennies per user outside of the U.S., where it makes most of its money. Why doesn't the Wall Street Journal have any basic grasp of facts? It seems to believe its own reporting, which is so desperately slanted against Apple that virtually all of the claims it makes are flat out false. Apple is clearly interested in bringing its paid content to the widest possible audience. That's not news; it's what Apple has been long been doing with iTunes on Windows and Apple Music on Android. iTunes on Samsung TVs is a big, notable addition, but it's hardly an abandonment of Apple TV, which does a lot more than just play iTunes content the way that Windows PCs have been doing for more than a decade. 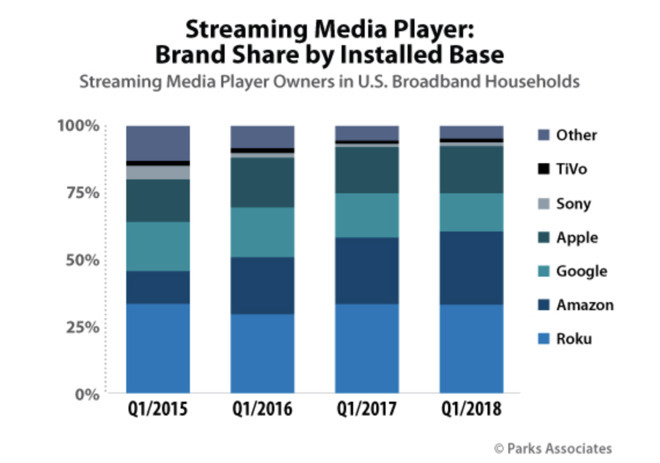 Mims minimized Apple TV's market penetration, writing that "its market share is anemic: only 15% of the U.S. installed base of media streaming devices, down from 19% in 2016." Conversely, it would seem that if Apple TV were waning in popularity and that nobody knew or cared about it, Samsung wouldn't be proudly announcing a partnership with Apple's iTunes service and the box's popular AirPlay 2 feature at the general audience of CES this year. In fact, rather than being a desperate final stab by Apple at finding a few more iTunes customers before it goes out of business, the news that every major TV maker is licensing AirPlay 2 -- and that the world's leading television maker is incorporating support for iTunes video content -- really tells us more about the state of the rest of the industry. That's curiously something the Wall Street Journal seemed intent to obscure with its wildly nonsensical claims about media streaming and content services. If Google's Android were so ascendant and "the norm," why would TV makers be excitedly promoting the ability to work with Apple's AirPlay 2, which Android doesn't even use? If the world was happy with Android, why aren't television makers content with supporting Google's own ChromeCast protocol, which iPhones can also use? And why would the public be interested in iTunes if they already have access to movies from Amazon, Google, Netflix, and others? It's because the people buying fancy Samsung televisions are largely iPhone users, and they also use iTunes and prefer the effortless, multi-room, instant streaming AirPlay 2 to diddling about with ChromeCast. The reality is that the industry is recognizing that Apple's protocols and platforms can no longer be ignored. Back in 2004, Samsung was supporting Microsoft's PlaysForSure and Windows Mobile. In 2012, Samsung joined Google, Microsoft, Blackberry, Nvidia, Qualcomm and other industry heavyweights to back the protocol known as Miracast published as a standard by the Wi-Fi Alliance as an effort to directly compete with Apple's AirPlay. That grand industry alliance fell apart; support was dropped by Android by 2015. After 2013 Samsung was promoting Google's ChromeCast, along with its own proprietary Smart View protocol. In 2014 Samsung launched its own Milk Music streaming service, which it shut down in 2016 after failing to find enough interest. 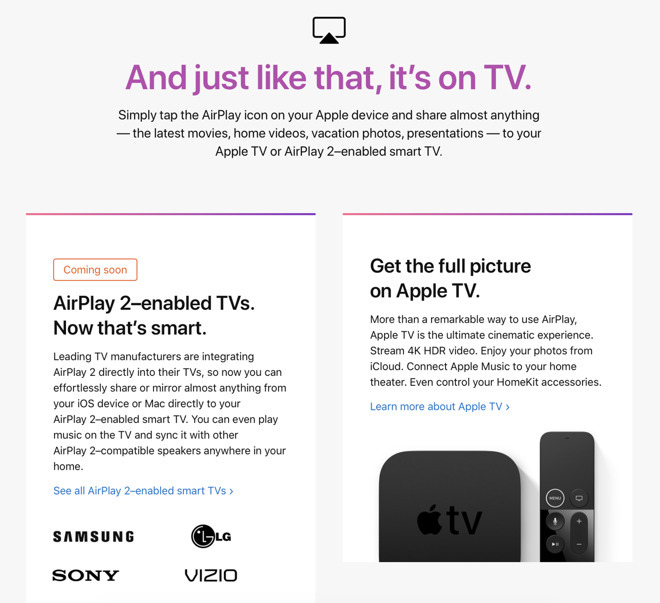 While the Wall Street Journal is portraying Apple's new iTunes and AirPlay 2 partnerships as a white flag of defeat for Apple's own hardware, the reality is that it is actually an endorsement of Apple's protocols being important enough for major television makers to support, because far more affluent TV buyers own iPhones than Samsung Galaxy devices, and because both Samsung and the larger industry's various efforts to copy AirPlay have failed to work out. And while Mims crowed about Apple sacrificing its hardware sales to promote the ability to sell iTunes, its quite obvious that widespread adoption of AirPlay 2 will not only boost Apple Music and iTunes, but can also only help sales of Macs and iOS devices, and will also make Apple TV, HomePod, Siri and HomeKit more attractive as well. And given that nearly half of smart TV buyers buy a media streaming box anyway, it's pretty clear that access to broadening the penetration of iTunes and AirPlay 2 will only whet buyer's appetites for the full Apple TV experience, which adds support for a nicer interface, a wide variety of other channels and services, games and other features, from iCloud Photos to Podcasts. While a series of recent reports from the Journal have been sloppily cobbled together by inexperienced bloggers who just recently started covering Apple for the newspaper, Mims isn't one of them. Even back in 2015, Mims wasn't a new writer when he wrote that Apple should "kill off the Mac" and "focus on products which represent the future," in part because Macs were generating less than 10 percent of Apple's total revenues and "Apple doesn't need this revenue." If Apple had taken Mims' advice offered by the Wall Street Journal in 2015, it would have given up sales of about 56 million Macs and revenue of $74.2 billion, just to "focus" on mobile iOS devices targeting two markets that are shrinking globally: smartphones and tablets. To visualize that large number, it is nearly 15 times what Rupert Murdoch spent to acquire the Wall Street Journal. Personally I'd like to see Apple make their TV app the center of the Apple TV experience. Right now it's confusing with so many different apps and interfaces, some of which work with the TV app while others don't. Does Apple have to pay these tv manufacturers to have iTunes on their hardware? Or since they both receive benefits it's a wash? It seems more like a confirmation that Apple is continuing to shift their strategy. Apple is not likely to make a standalone TV now. Yes, Apple Music was on android but further evidence that the shift is happening away from the walled-in strategy with their hardware. On another note, having read Appleinsider for many years. Did WSJ do some sort of harm to AI? The attacks and defensiveness of some recent AI articles is off-putting. At present, we believe the manufacturers are paying a license fee to Apple in the same way that audio companies do. We're still working on this. 1) Apples next Apple TV is gonna be a powerhouse. At least with an A10 chip. If Apple can go all out with an A12X chip with a focus on gaming there will be many benefits of owning one. 2) Free on Apple devices but paid on on other devices would be wonderful! The TV App fails when it crams in purchasable content with your paid content. Makes me skip the mess. They could easily add an "iTunes" tab if they still want us to buy more but mixing it in with my viewable content is confusing. I doubt Apple pays them anything and I also doubt they pay Apple anything. It’s simply another big selling feature for their TVs (like having YouTube or Netflix built-in). winner as people will almost surely buy or rent content through iTunes (for the Samsung TVs right now). And that puts money straight into Apples pocket. There's no shift. Apple never announced, nor likely ever intended, to make a standalone TV and compete in the low profit commoditized world of TV screens. Never made any sense. There's nothing for Apple to offer, when they are all buying their screens from a couple of manufacturers and bundling them in their own package. In contrast, Apple TV is a high margin, very differentiated product that enhances the Apple ecosystem for its customers. This ones confusing. Rogifan was teasing when asking if Samsung should get a cut of iTunes sales. But in Samsungs case it's more of a benefit to have iTunes on Samsung. I'm guessing Samsung signed the deal to gain sales by having an Apple app and Apple of course gets a cut from movie/tv show sales. Who wouldn't want Apple apps on their products? This idea of an Apple TV never made any sense as Apple doesn't get into low margin, commoditized businesses unless it has something to differentiate it and command a suitable profit margin. Heck, major players like Panasonic and Sony have been pulling back because low margin companies like Vizio have cannibalized sales as consumers can't tell a meaningful difference between the screens (for the most part, now that we are well into HD, 4K, etc., the TV's are all great), leaving the companies to compete on price--not Apple's market. Apple Streaming will be like Netflix, but with the TV App access to other streaming services all-in-one as an option. Most likely they'll look at the notion of Amazon Prime and create a tiered structure within a revamped iCloud to provide other `services' that include the Streaming Service as part of the package. There is nothing new that numerous commentators hate the "garden wall style" of Apple and embrace the "openness" of Microsoft. They'll take any opportunity to take a shot at Apple. Haters will hate. Anyone who thinks this isn’t a significant shift in strategy is blind. And stop bringing up iPod. The Mac in the early 2000s was nothing like iOS is today. The only way Apple was going to grow iPod (and iTunes) sales was via Windows. That is absolutely not the case today. Of course if Apple is building something to compete with Netflix/Amazon/HBO then yeah that services needs to be everywhere. But that is a strategy shift. The latest episode of Ben Thompson’s excellent podcast explains it well. If DED thinks this is the right strategy then that’s what he should be arguing and providing reasons why he thinks it’s the right business move. It is especially hard hitting when DED writes of late, but on the topic of the poorly researched, poorly reasoned, click bait articles written by the vast majority of the tech press, he is spot on, and therapeutic for those of us tired of reading it the nonsense. You also have to give it to him that he provides more facts to back up his positions than the silly articles he takes issues with. It's actually the other way around when it comes to TV's. Content providers pay TV manufacturers to have apps on their TV's. My guess is Apple is paying Samsung. EDIT: I wanted to add it's possible Samsung and Apple agreed on Samsung not collecting money from Apple for iTunes App in exchange for licensing AirPlay. It’s alarming the degree Murdoch’s Wall Street Journal is a walled garden of ignorance regarding Apple, one of the most powerful shapers of the future. But at least enjoy seeing DED eviscerate the WSJ Mims and Mickle tag team while educating readers about long-term trends. Ben Thompson is often wrong. His problem is he looks at the present and then mistakenly believes that there are always a small number of variables that controlled an outcome that he is uniquely able to divine, and then he makes a broad prediction, when in reality there are so many variables that control an outcome. For example, just a short while back he scoffed at Apple ever being a major player with services, saying they were terrible at it and could never compete with Google that was so far ahead. In reality, Apple was already a major player in Services (the App Store anyone?) and Apple's services will soon hit $50 Billion in revenue. In the issue at hand, he wrote his article too soon, as more news came out, it turns out that Samsung and others actually experienced greater declines because of China. Yes, I've read before that services pay TV manufacturers and platforms for placement on-screen and on the remote, and never seen that it's the other way around. It makes sense that Apple has offered some profit-sharing arrangement to entice Samsung, Sony, etc if incorporating profit-making Apple services. Don't know tho if Air Play would be considered one of those, but if we're talking about iTunes I think it's a given that the platform provider is getting a share of the wealth. IMO how else to explain everyone jumping on board at the same time? Agreed, their premise is entirely flawed -- Apple has licensed AirPlay to hardware vendors for almost as long as AirPlay. Just as they have licensed MFI docks, etc. None of that is what is meant by the "walled garden", dur. It does this now -- the default is for the ATV home screen to be the TV app. (I didn't like this tho and immediately switched back to the home screen). If a video app doesn't support the TV app, that's their decision. Amazon Prime does, HBO Go does, Netflix does not. Someone please email this article to Mims.